Images license: creative commons Attribution-ShareAlike 4.0. 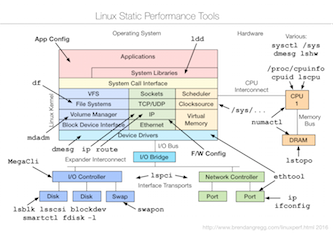 This page links to various Linux performance material I've created, including the tools maps on the right. The first is a hi-res version combining observability, static performance tuning, and perf-tools/bcc (see discussion). 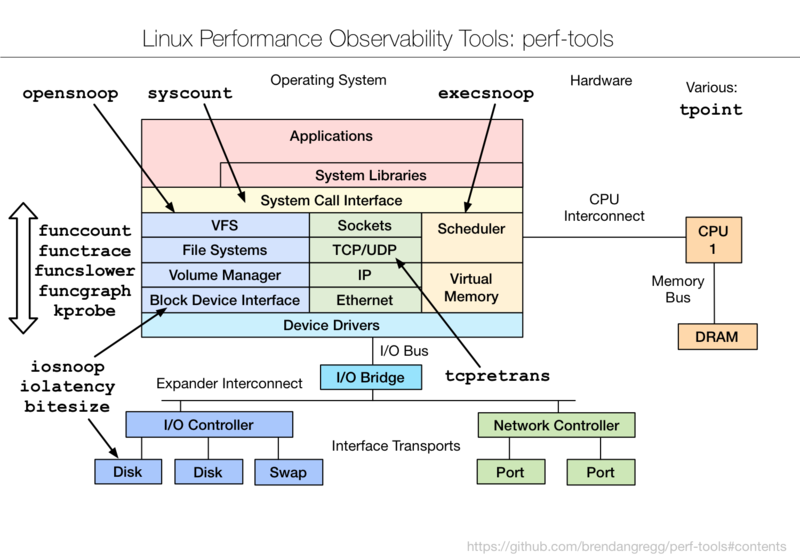 The remainder were designed for use in slide decks and have larger fonts and arrows, and show: Linux observability tools, Linux benchmarking tools, Linux tuning tools, and Linux sar. For even more diagrams, see my slide decks below. perf_events: perf one-liners, examples, visualizations. 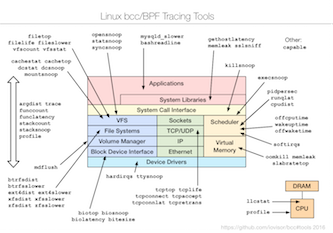 eBPF tools: eBPF tracing tools and examples with bcc. perf-tools: perf analysis tools using ftrace (github). bcc: perf analysis tools using eBPF (github). ktap: one-liners, examples, and scripts. Flame Graphs: using perf, SystemTap, and ktap. 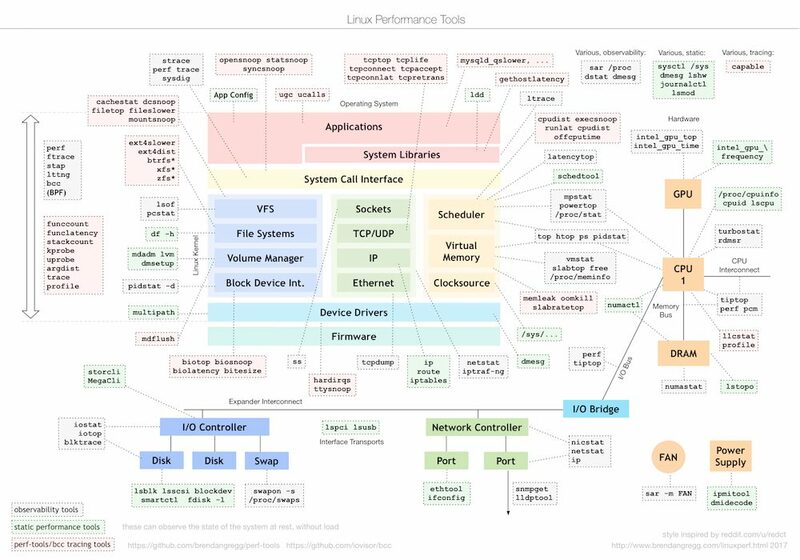 Linux Performance Analysis in 60,000 Milliseconds shows the first ten commands to use in an investigation (video, PDF). Written by myself and the performance engineering team at Netflix (2015). My post Performance Tuning Linux Instances on EC2 includes the tunables we're using at Netflix (2015). A post on Linux Load Averages: Solving the Mystery, explaining what they are and why they include the uninterruptible sleep state (2017). A gdb Debugging Full Example (Tutorial), including the use of some perf/debugging tools (2016). My lwn.net article Ftrace: The Hidden Light Switch shows a use case for Linux ftrace (Aug, 2014). Posts about perf-based perf-tools: perf Hacktogram. A page on Working Set Size Estimation for Linux (2018+). A post on KPTI/KAISER Meltdown Initial Performance Regressions (2018). In The PMCs of EC2: Measuring IPC I showed the new Performance Monitoring Counter (PMC) support in the AWS EC2 cloud (2017). CPU Utilization is Wrong: a post explaining the growing problem of memory stall cycles dominating the %CPU metric (2017). A post about Linux 4.7 Hist Triggers (2016). The blog post strace Wow Much Syscall discusses strace(1) for production use, and compares it to advanced tracing tools (2014). 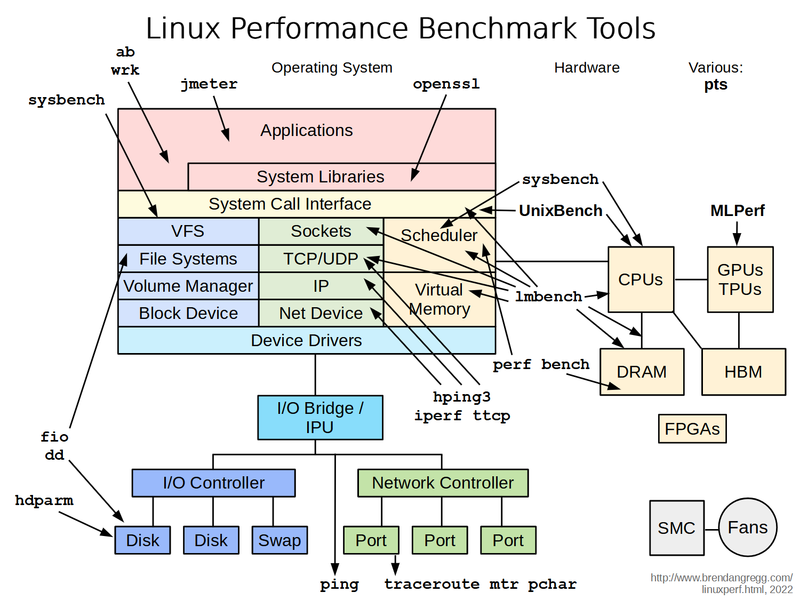 USE Method: Linux Performance Checklist; also see the USE Method page for the description of this methodology. Off-CPU Analysis Method, where I demonstrate this methodology on Linux. 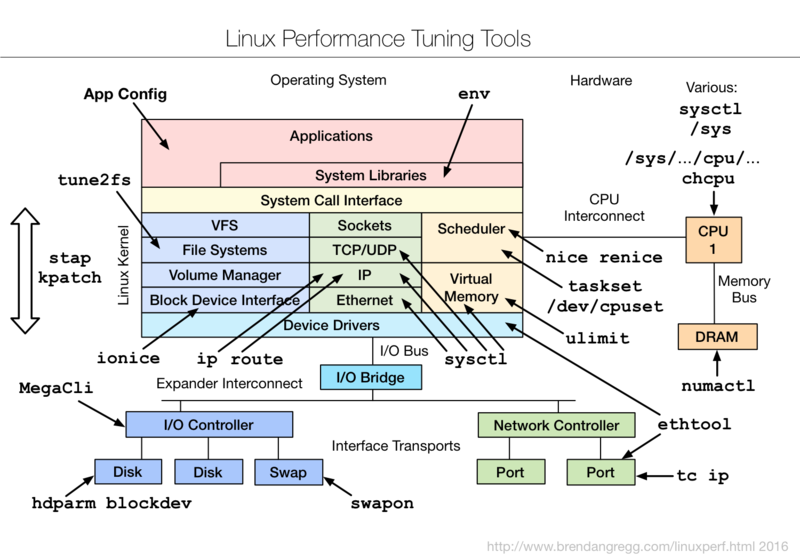 Systems Performance: Enterprise and the Cloud (Prentice Hall, 2013) uses Linux distributions as the primary example. 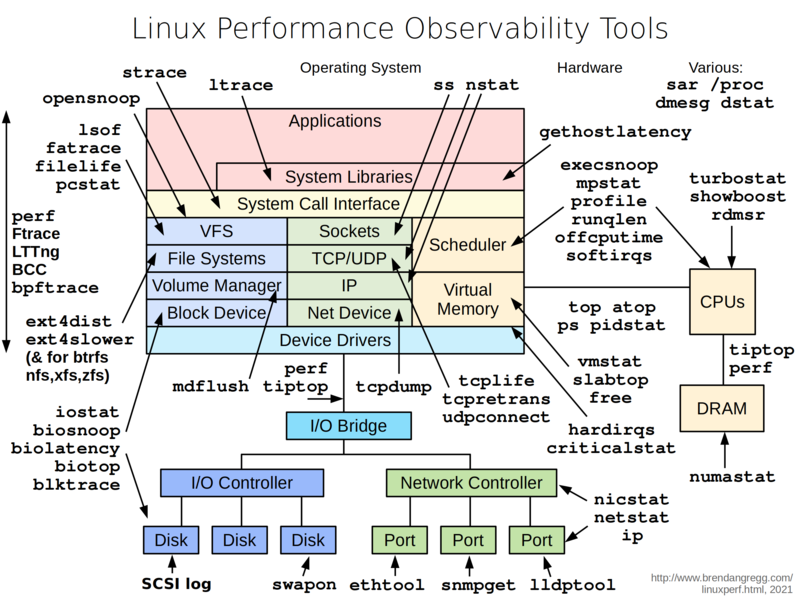 This is my summary of Linux systems performance in 50 minutes, covering six facets: observability, methodologies, benchmarking, profiling, tracing, and tuning. It's intended for people who have limited appetite for this topic. A video of the talk is on percona.com, and the slides are on slideshare or as a PDF. For a lot more information on observability tools, profiling, and tracing, see the talks that follow. This was a 20 minute keynote summary of recent changes and features in Linux performance in 2018. A video of the talk is on youtube, and the slides are on slideshare or as a PDF. 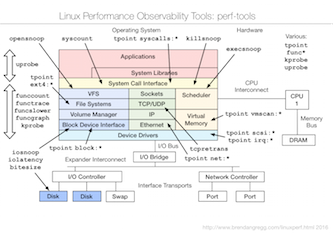 At Velocity 2015, I gave a 90 minute tutorial on Linux performance tools, summarizing performance observability, benchmarking, tuning, static performance tuning, and tracing tools. I also covered performance methodology, and included some live demos. 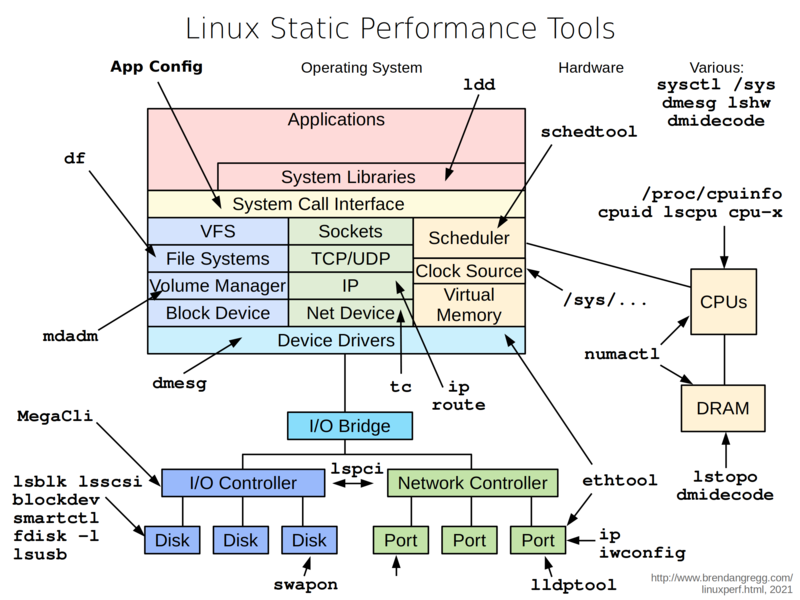 This should be useful for everyone working on Linux systems. If you just saw my PerconaLive2016 talk, then some content should be familiar, but with many extras: I focus a lot more on the tools in this talk. A video of the talk is on youtube (playlist; part 1, part 2) and the slides are on slideshare or as a PDF. This was similar to my SCaLE11x and LinuxCon talks, however, with 90 minutes I was able to cover more tools and methodologies, making it the most complete tour of the topic I've done. I also posted about it on the Netflix Tech Blog. Instead of performance observability, this talk is about tuning. I begin by providing Netflix background, covering instance types and features in the AWS EC2 cloud, and then talk about Linux kernel tunables and observability. At DockerCon 2017 in Austin, I gave a talk on Linux container performance analysis, showing how to find bottlenecks in the host vs the container, how to profiler container apps, and dig deeper into the kernel. A video of the talk is on youtube and the slides are on slideshare. At the Southern California Linux Expo (SCaLE 14x), I gave a talk on Broken Linux Performance Tools. 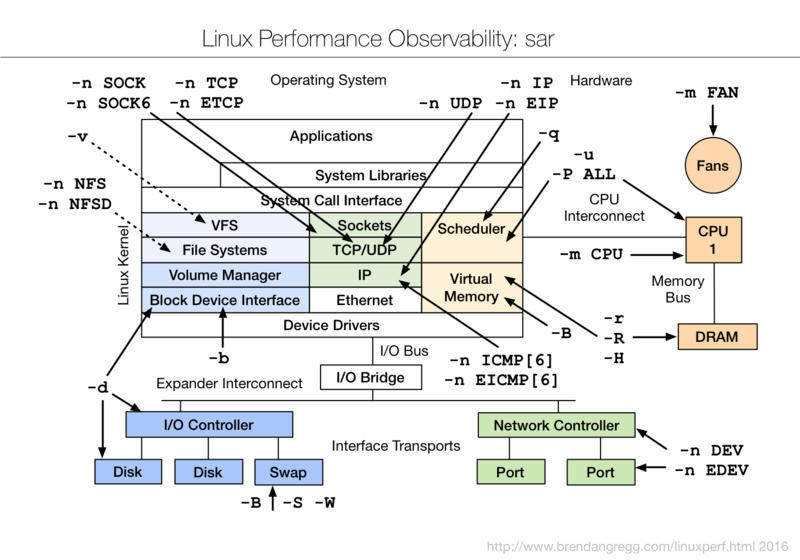 This was a follow-on to my earlier Linux Performance Tools talk originally at SCaLE11x (and more recently at Velocity as a tutorial). This broken tools talk was a tour of common problems with Linux system tools, metrics, statistics, visualizations, measurement overhead, and benchmarks. It also includes advice on how to cope (the green "What You Can Do" slides). A video of the talk is on youtube and the slides are on slideshare or as a PDF. At Kernel Recipes 2017 I gave an updated talk on Linux perf at Netflix, focusing on getting CPU profiling and flame graphs to work. This talk includes a crash course on perf_events, plus gotchas such as fixing stack traces and symbols when profiling Java, Node.js, VMs, and containers. There's also an older version of this talk from 2015, which I've posted about. To learn more about flame graphs, see my flame graphs presentation. I gave this demo at USENIX/LISA 2016, showing ftrace, perf, and bcc/BPF. A video is on youtube. 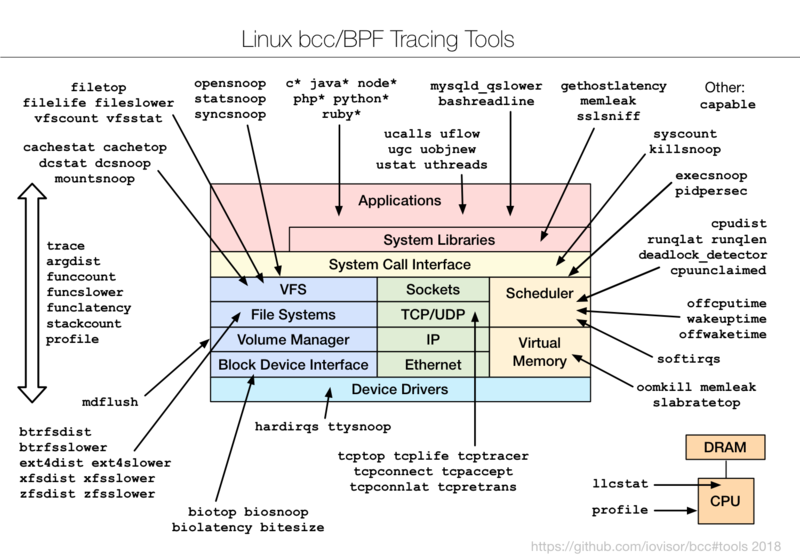 This was the first part of a longer talk on Linux 4.x Tracing Tools: Using BPF Superpowers. See the full talk video and talk slides. This talk covers using enhanced BPF (aka eBPF) features added to the Linux 4.x series for performance analysis, observability, and debugging. The front-end used in this talk is bcc (BPF compiler collection), an open source project that provides BPF interfaces and a collection of tools. At USENIX LISA 2014, I gave a talk on the new ftrace and perf_events tools I've been developing: the perf-tools collection on github, which mostly uses ftrace: a tracer that has been built into the Linux kernel for many years, but few have discovered (practically a secret). A video of the talk is on youtube, and the slides are on slideshare or as a PDF. In a post about this talk, I included some more screenshots of these tools in action. At SREcon 2016 Santa Clara, I gave the closing talk on performance checklists for SREs (Site Reliability Engineers). The later half of this talk included Linux checklists for incident performance response. 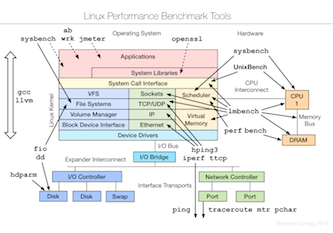 These may be useful whether you're analyzing Linux performance in a hurry or not. A video of the talk is on youtube and usenix, and the slides are on slideshare and as a PDF. I included the checklists in a blog post. Performance analysis & tuning of Red Hat Enterprise Linux - 2015 Red Hat Summit (video 2hrs): this is a great and in-depth tour of Linux performance tuning that should be largely applicable to all Linux distros. 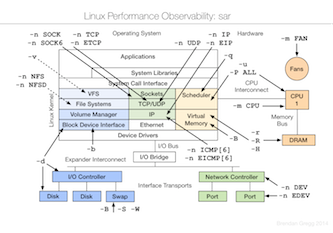 Linux Instrumentation: slides from a great talk in June 2010 by Ian Munsie, which summarizes the different Linux tracers very well. If you're trying to understand all the tracers and frameworks, this is worth studying (keeping in mind it's from 2010). Julia Evans blog has many posts about many topics, including performance tools. 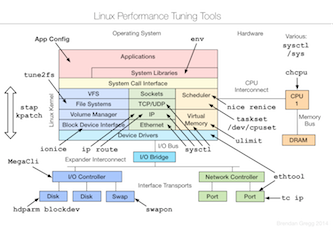 Davidlohr Bueso's Linux performance posts.